Ibrahim likes to read a lot! Oh! I just noticed the little paper fan he made, I used to make those all the time! Hahaha well actually he’s just tapping papers, but I can see why you’d think it’s a fan. Oh well, I’m sure the kids could have made it. XD Thanks! I am back once again to say your still doing a great job Miss Sarah! Happy Valentine’s Day to you too Sarah! You’ll have no idea how many alternate names for it we’ve come up with. Also that’s another thing Ibrahim and I seem to have in common – daddy issues. Thank you so much! And yes, daddy issues. Ibrahim shares your misgivings. I’ll make him give you a Valentine. Happy Valentine’s Day to everybody even Coal. Hahaha, thanks! Coal grumps at you. HAHAHAHA! Wow. Wooooow. Now that’s something. Somewhere, Hedda and Coal have become stuck in tight quarters for the entire day, and Loki is to blame. Will Hedda fall for Coal’s charms good looks moody teen angst? Will Coal be able to maintain his grumpiness levels? hint: yes. Will Loki have to run forevermore to escape Coal’s wrath? Haha! That’s definitely a fun scenario to imagine! Though I imagine it’s just a lot of silence. Yes. Lots of uncomfortable silence with the sounds of Loki’s laughter not too distant. 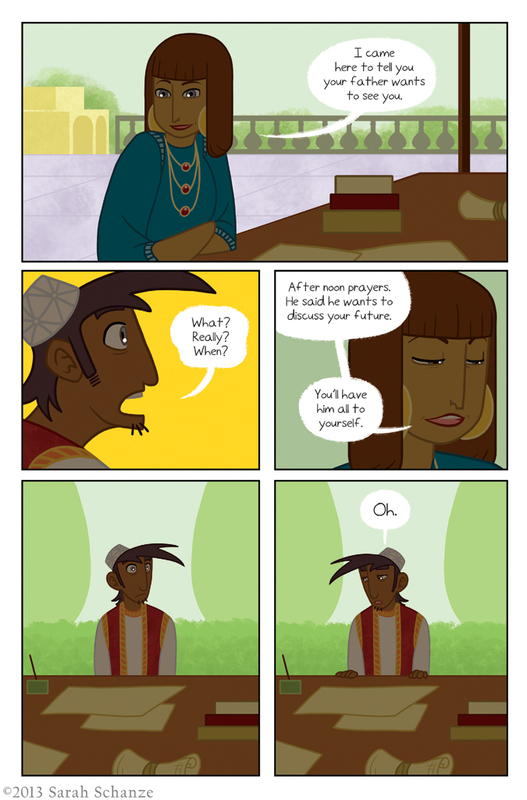 Poor Ibrahim. I’m guessing his father doesn’t much care for his scholarly pursuits. Thank you! Yes, Ibrahim will need all the luck he can get. Ibrahim’s whiskers are to be shaved off. Yep! No plot here folks, that beard is just not coming in as fully as Ibrahim thinks it will and he looks silly. I honestly have almost no idea. I only saw one drawing of what a woman might have looked like at that time and place, and at first Ibrahim’s mom’s design was much more similar to that. Too similar, actually, so I changed things like the color of the dress and jewelry. But I liked the hair, so I kept that. It might not be right, but it’s really hard finding information about it at all, and almost impossible to find images. Iconoclast? Only her hairdresser knows for sure.